The KONG Jumbler 2-in-1 is a toy for your dog. This toy can withstand intensive play and is therefore also suitable for fetching games. The KONG Jumbler 2-in-1 is a toy ball for your dog. The tennis ball on the inside and the squeaker provide lots of fun play time. Thanks to the handles, you can easily pick up the ball and shake it. The KONG Jumbler is also suitable for intensive fetching games. Available in two forms and sizes. Please note: You cannot select a colour, this product is delivered at random. 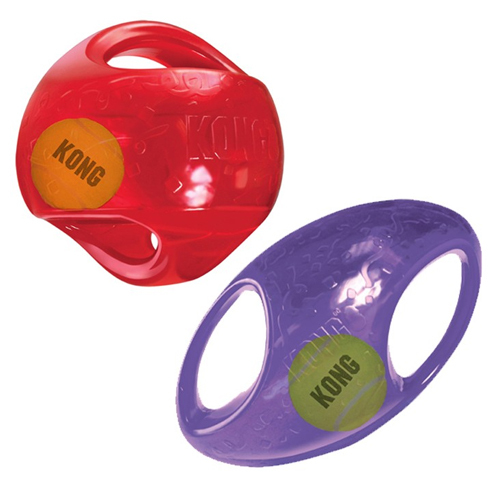 Have you used KONG Jumbler before? Let us know what you think about this product.